Microsoft Dynamics 365 has evolved into a cloud solution with new purpose-built apps for Sales, Customer Service, Project Services and Field Services. Microsoft has also provided an app marketplace to support a whole host of 3rd party apps. AppSource is a hub of trusted partners and solutions that you can use to find apps to meet your specific needs. You can find AppSource online and also embedded in your Dynamics 365 (found in Settings > Dynamics Marketplace). Within AppSource you can search, browse and read all about the apps available; both free and paid. There are two types of business apps within AppSource. "Apps Extensions" is considered to be a simple, single purpose feature, such as a mapping tool in Dynamics 365. The other is the "Solution App" that cover larger industry solutions such as a full membership management solution. AppSource contains more than 200 business SaaS apps, add-ins and content packs, including exclusive new industry-specific business apps. 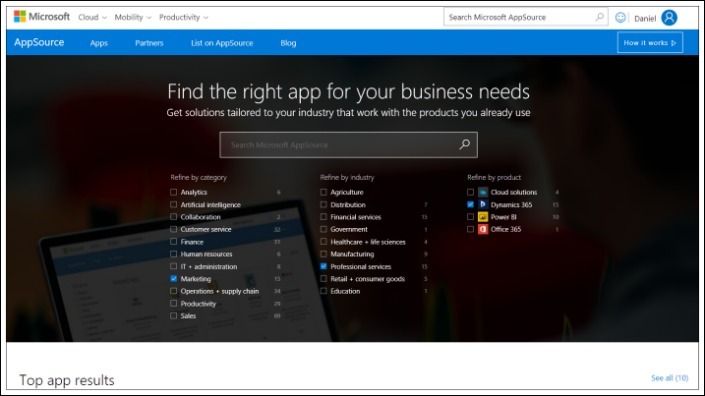 Microsoft AppSource lets you search by solution category, industry or Microsoft product. Once you have found the application you require, clicking on the relevant icon takes you to the product details page. From there you can request a free trial and install them into your online products. Pick an App in the catalogue by clicking the action button "Get a Trial", "Get It Now" or "More Info". In this demonstration we are going with "Workflow". Once you have gone through the set up process the app solution should be ready to install. 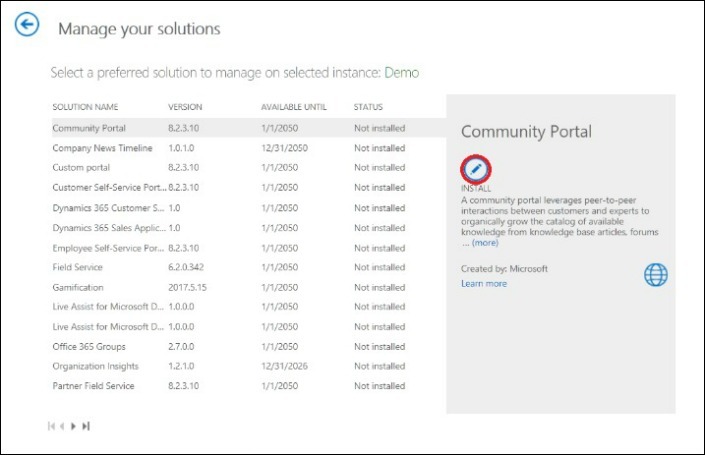 You will be navigated to the "Manage your solutions" window were you select your app and click INSTALL. The app is now installed on your Portal Office. To see whether the app has been successfully installed, navigate to "Admin centers" in Office 365 and click "Dynamics 365" in the dropdown menu. 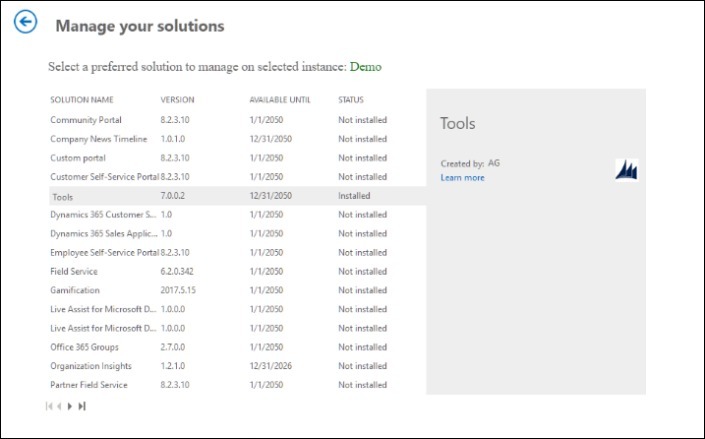 In the Dynamics 365 Administration Center, highlight the CRM instance that you installed the app to and click Solutions. 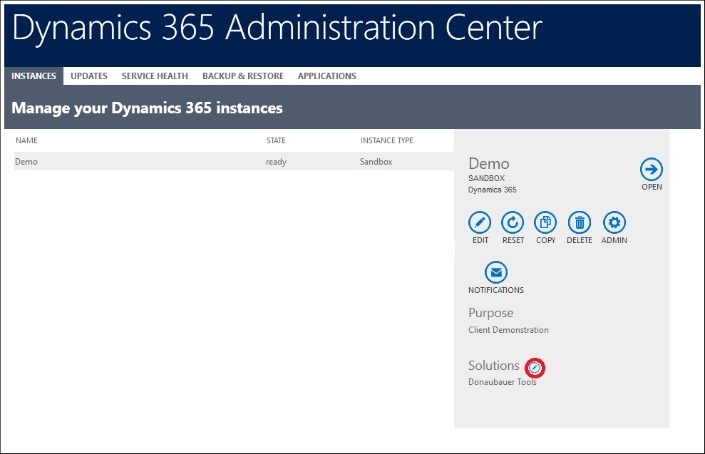 You will find all pre-existing and installed apps that are available in your Dynamics 365 instance. The final step is to access Dynamics 365 and navigate to Settings > Customization > Solutions. In the "All Solutions" section you will need to find your App that you recently installed and simply activate its feature. 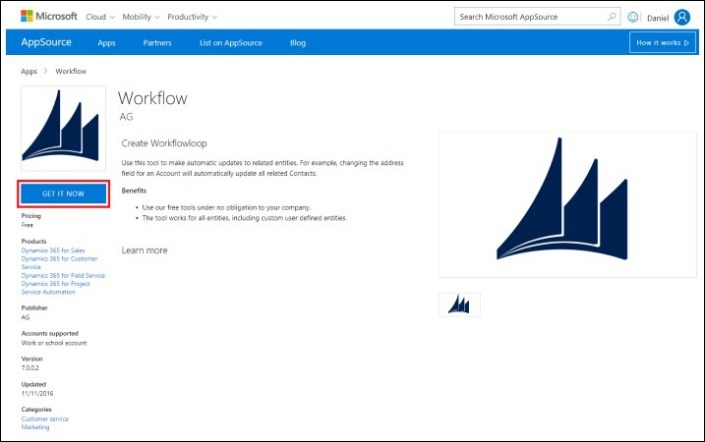 You will need to find the installed app within Dynamics 365, depending on which app, it may be located in the top navigation bar as an App or an entity. 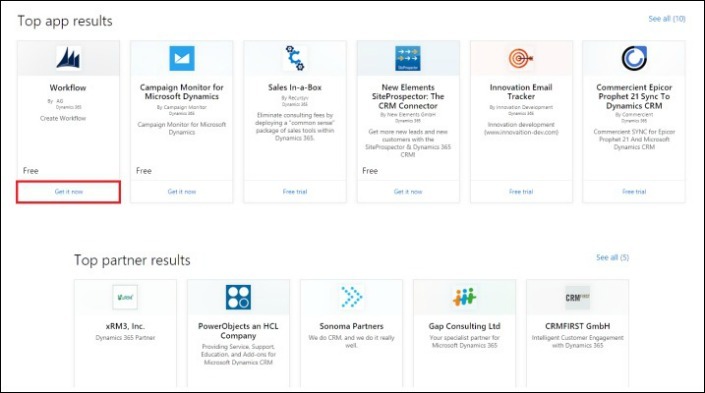 With Dynamics 365 and AppSource, customers can encourage innovation, increase collaboration and ultimately achieve more with the power of intelligent business apps. Contact Us today for more information on Microsoft AppSource for Dynamics 365, alternatively you can take out a 30 day, no obligation Free Trial and begin your search for Apps that may suite your business.